I did the basket already a few days ago. And yesterday, while I was waiting for some corrections on a pattern I am testing to arrive, I managed to get the Chi out of my ravelry queue. That chi is so dang cute. How do you keep him from being too top heavy? What will you use the basket for? Both very nice! Is the basket a free pattern, or did you make it up? Can I have the pattern link to go in our sidebar? Aww, the chi is cute. I like that lil’ basket, too. both are sweet……..does the pup fit into the basket? @ Morgan: My first attempt was to stuff it very lightly, but that didn’t work for me. I thought of a putting a bit of polystyrole pellets in, but didn’t have any, so I put one of those yellow insides of chocolate kinder eggs in it and filled the rest with ordinary stuffing. Still not optimum, but good enough at the moment. The basket is holding a part of my earrings actually. @ June: the basket is a free pattern, as is the Chihuahua. 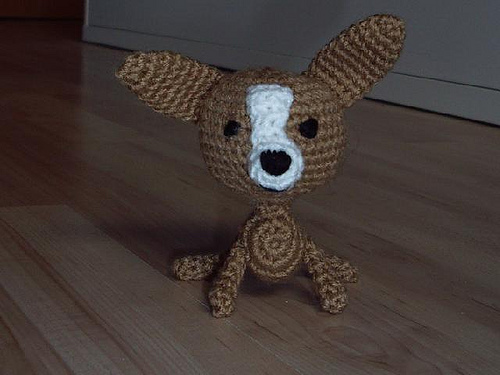 http://katcrochet.com/chi.htm is the Chihuahua (but the page is notoriously over its allowed traffic, so I got the pdf-file from a fellow raveler). @ Val: Yes, he does, he’s tiny. 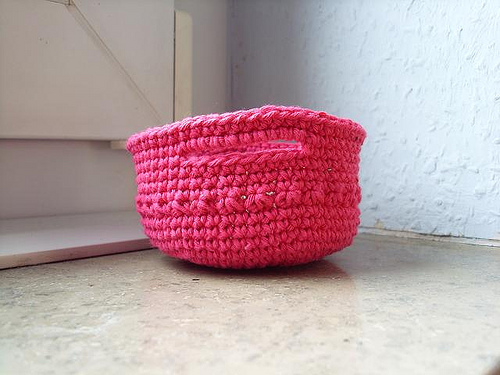 The basket is about 8 cm in diameter and 4,5 cm high. The Chi measures 9 cm from head to toe (excluding the ears) and its body is 5 cm long.